Defend® BCAA is a reformulated version of the Defend Full Spectrum Amino Acid. Grenade have stripped out the full spectrum amino blend and replaced with a potent 7 grams of BCAA's at a 2:1:1 ratio. Grenade Funnel still included in every tub! To achieve this delicate but crucial balance, you’ve got to be regularly making the most important amino acids available to your muscles. Defend has been formulated with all of the most anabolic and anti-catabolic amino acids required by the human body in an unbelievable tasting powdered drink mix, so you’ll never be caught short when it comes to supplying your muscles with the most potent building blocks required for their growth and repair! Defend is designed to be used throughout the day, either with meals to enhance the amino acid profile of your diet or between meals as an anticatabolic. It also makes a perfect Intra-Workout or Post-Workout supplement (along with your protein shake) as a broader spectrum alternative to BCAAs. High nitric oxide levels and improved blood flow have been associated with increased weight training performance, increased muscle protein synthesis, increased Protein content in muscle, reduced fatigue, increased energy production and increased creatine phosphate production [2,3,4]. Glutamine peptides have long been recognised as a stable form of glutamine by bodybuilders and other strength athletes who use them for their purported cell-volumising and anticatabolic effect synthesis, increased protein content in muscle, reduced fatigue, increased energy production and increased creatine phosphate production [2,3,4]. 1. Drummond MJ, Rasmussen BB. Leucineenriched n trients and the regulation of mammalian target of rapamycin signalling and human skeletal muscle protein synthesis. Curr Opin Clin Nutr Metab Care. 2008 May;11(3):222-6. doi: 10.1097/ MCO.0b013e3282fa17fb. 2. Schwedhelm E, Maas R, Freese R, Jung D, Lukacs Z, Jambrecina A, Spickler W, Schulze F, Böger RH. Pharmacokinetic and pharmacodynamic properties of oral L-citrulline and L-arginine: impact on nitric oxide metabolism. Br J Clin Pharmacol. 2008 Jan;65(1):51-9. Epub 2007 Jul 27. 3. Pérez-Guisado J, Jakeman PM. Citrulline malate enhances athletic anaerobic performance and relieves muscle soreness. J Strength Cond Res. 2010 May;24(5):1215 -22. 4. Osowska S, Duchemann T, Walrand S, Paillard A, Boirie Y, Cynober L, Moinard C. Citrulline modulates muscle protein metabolism in old malnourished rats. Am J Physiol Endocrinol Metab. 2006 Sep;291(3):E582-6. Epub 2006 Apr 11. Fermented Branched Chain Amino Acids 2.1.1 (Leucine, Isoleucine, Valine), Flavourings, Resistant Dextrin, Citric Acid, L-Glutamine, Powdered Coconut Water, Sweeteners: Acesulfame K, Sucralose; DL-Malic Acid, Sodium Citrate, Monopotassium Phosphate, Leucine Peptides (MILK), Glutamine Peptides (SOY, MILK), Anti-caking Agent: Calcium Silicate; Fermented L-Isoleucine, Vegan L-Valine, Vitamin Blend (Ascorbic Acid, Nicotinamide, Pyridoxine Hydrochloride, Thiamine Hydrochloride, Cyanocobalamin), Magnesium Citrate, Colour: E124. 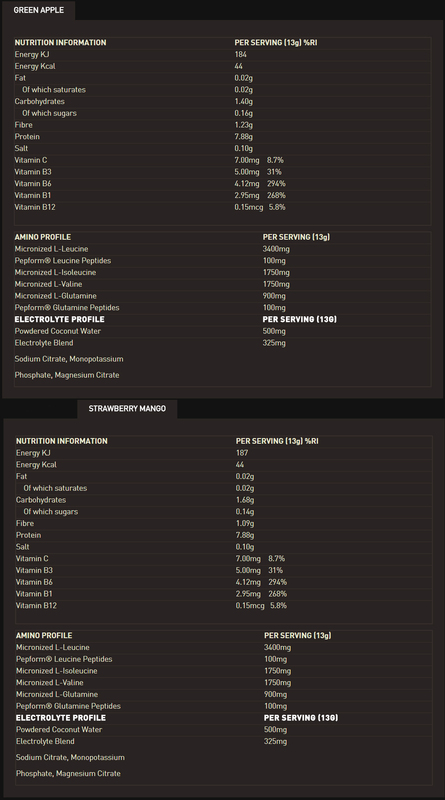 Fermented Branched Chain Amino Acids 2.1.1 (Leucine, Isoleucine, Valine), Resistant Dextrin, Flavourings, DL-Malic Acid, L-Glutamine, Powdered Coconut Water, Citric Acid, Sweeteners: Acesulfame K, Sucralose; Sodium Citrate, Monopotassium Phosphate, Leucine Peptides (MILK), Glutamine Peptides (SOY, MILK), Anti-Caking Agent: Calcium Silicate; Fermented L-Isoleucine, Vegan L-Valine, Natural Colouring: Curcumin; Vitamin Blend (Ascorbic Acid, Nicotinamide, Pyridoxine Hydrochloride, Thiamine Hydrochloride, Cyanocobalamin), Magnesium Citrate, Colour: E131.